A fan coil unit (FCU) is a simple device consisting of a heating and/or cooling heat exchange or ‘coil’ and fan. It is part of an HVAC system found in residential, commercial, and industrial buildings. 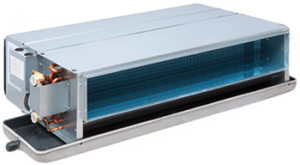 A fan coil unit is a diverse device sometimes using duct work and is used to control the temperature in the space where it is installed or serve multiple spaces. It is controlled either by a manual on/off switch or by a thermostat which controls the throughput of water to the heat exchanger using a control valve and/or the fan speed.